This script book literally puts the words in your mouth for every possible situation you’ll find yourself in as a network marketer. Learn how to become better at recruiting and customer gathering using these proven scripts for prospecting. 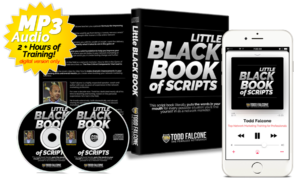 You’ll develop self-confidence quickly and be sounding like a master in no time with Todd’s coveted Little Black Book of Scripts. 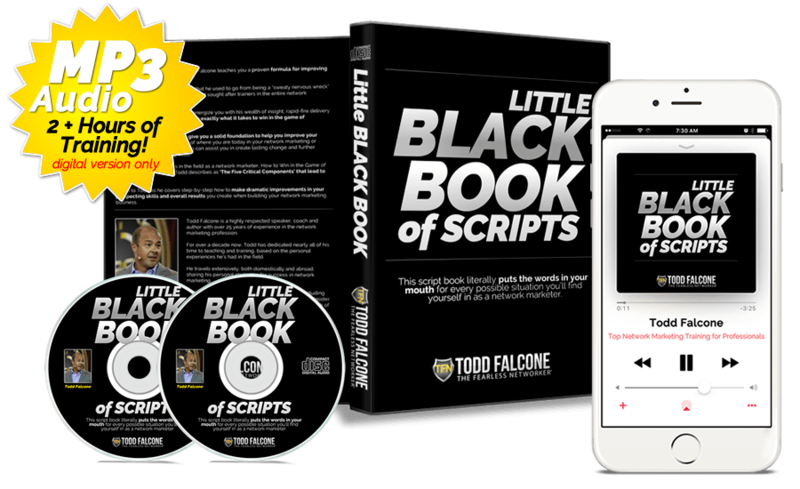 In this 80+ page script book, which also includes 2 Audio CD’s of Todd going through the entire script book with you, you’ll learn to approach people in a number of ways about your business. This script book puts the words in your mouth for literally every conceivable situation you’ll find yourself in as you’re out there prospecting for your network marketing or direct sales business. 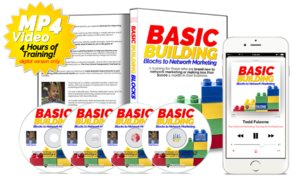 This is an incredibly comprehensive script book written by someone with over 25 years of experience in the network marketing profession. In fact, this is a compilation of ALL of the scripts Todd personally uses for his business.